As we begin 2019, we can’t help but get excited about what trends and projects this new year will bring! 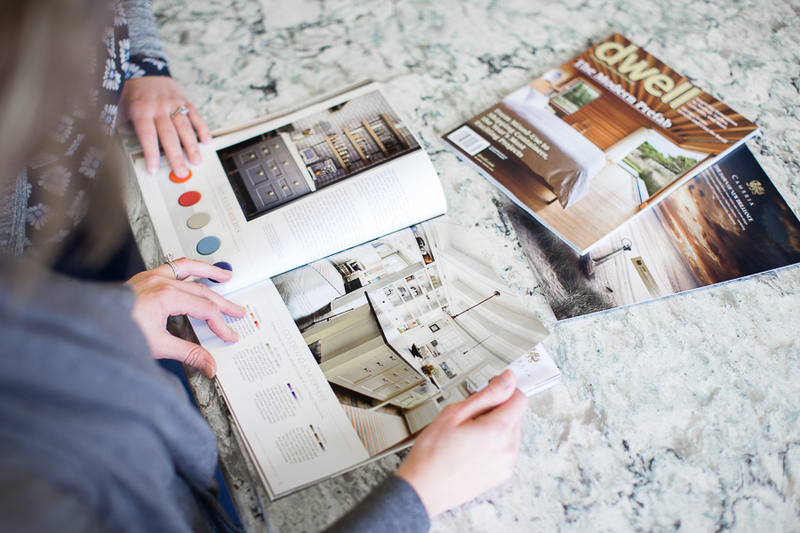 Our team loves few things more than a fresh set of plans or chatting about all things style and design. Wondering what trends we think we’ll be seeing a lot more of in the coming year? Read on below for our top five favorites! Spice up a neutral color palette by adding a splash of color like Sherwin Williams’ 2019 Color of the Year, Cavern Clay. This warm, earthy terracotta color will have you dreaming of sunsets on the beach while giving a subtle nod to mid-century modern style. Pair it with bright tiles, warm stone, and woodgrains for a casual, yet refined kitchen design. Along with more use of color, we’re predicting strong patterns will continue their rise in the coming year. From flooring to tile backsplashes to wallpaper, our clients are playing with pattern more than ever. We love this design choice because it can make a big impact with minimal effort. Metallic accents from silver to bronze to gold have all fallen into favor in recent years. However, instead of committing to just one metal for your kitchen’s hardware, light fixtures or appliances, current design trends are more about mixing and matching tones. Kitchens have moved beyond the classic layout of upper and lower cabinets, a center island, and integrated appliances. Right now, kitchen remodeling is about creating a unique space that reflects your specific wants and needs. Whether that includes floating shelves, an open-plan adjacent dining area, a mini bar, or any other custom features. Think clean lines, simple finishes, streamlined hardware and appliances, and modern style. Minimalism means clearing away the visual clutter and making space for beautiful design choices. This trend may not be for everyone, but when done well it’s remarkably elegant and sophisticated.